Today we go home! But first, we had a little side stop to make. Sometimes we get so caught up in the excitement of being home that we pass right by some really neat things. I wanted to make sure that didn't happen this time. Outside of Knoxville, Tennessee, is the "Secret City," Oak Ridge. Oak Ridge was created out of nothing in 1942 by the U.S. government. It housed the secret Manhattan Project - the development of the atomic bomb. Oak Ridge has a rich history in this massive undertaking, but I won't go into that here. If you'd like more information, Wikipedia has a lot of information HERE. 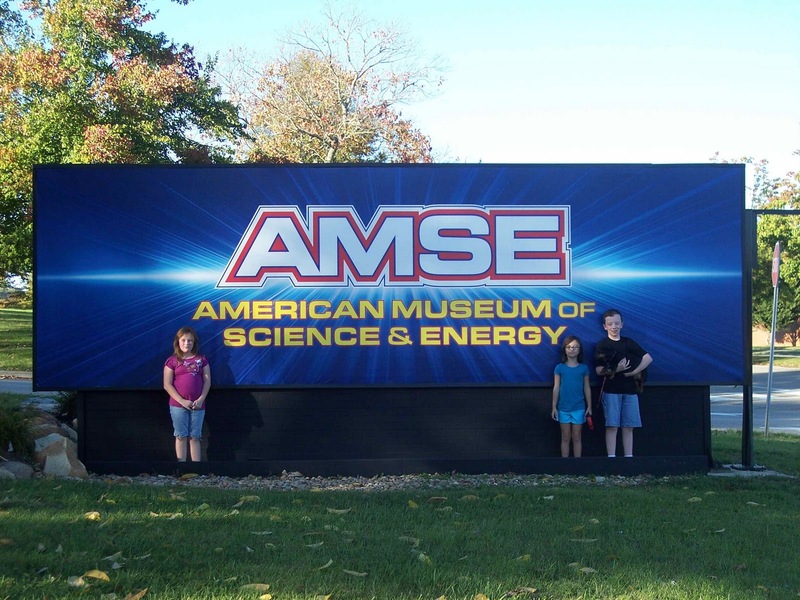 In Oak Ridge, our destination was the American Museum of Science and Energy. This museum has an extensive display of history on the town's development and the Manhattan Project, from bomb development through the end of World War II. 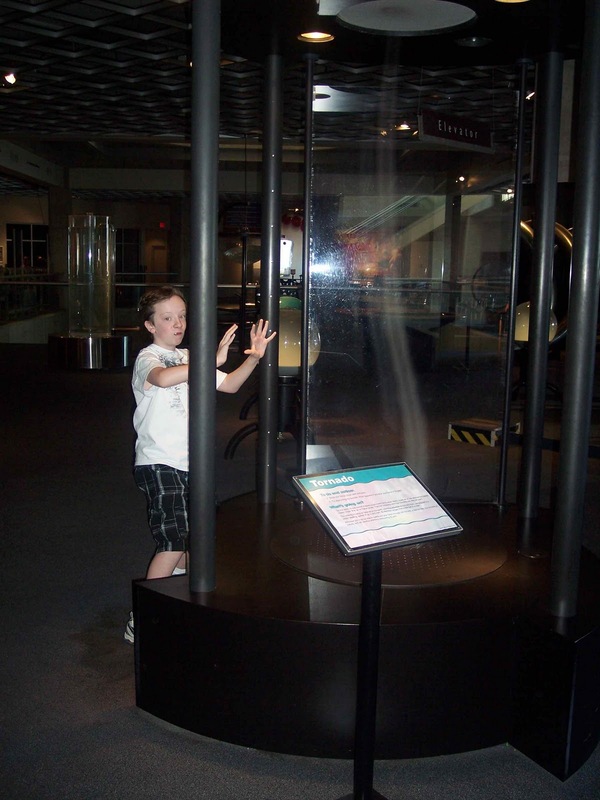 In addition to the Manhattan Project displays, there are many hands on science displays, with a lot focused on energy. There is an entire section on different kinds of energy, from coal to wind power. There was a large theater where we saw a show about static electricity and how it works. Everyone got the chance to 'experience' static electricity - which made your hair stand on end - literally! She is playing the pipes! They had a traveling exhibit called "Noise!" 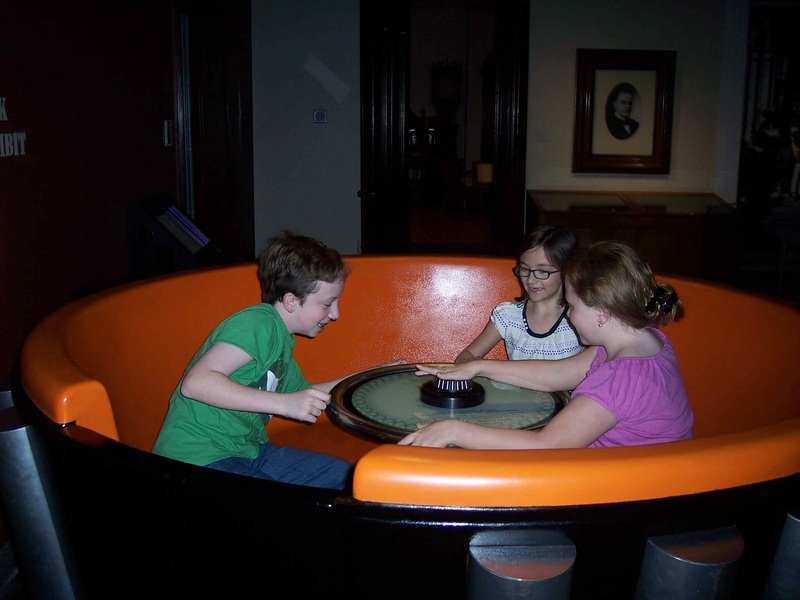 which showcases music, sound, and hearing with ten interactive stations. In all, we had a great time, but were anxious to get back on the road! Today we started out at Ft. Boonesboro, Kentucky. This is a duplicate of the fort built by Daniel Boone after he arrived in the area. 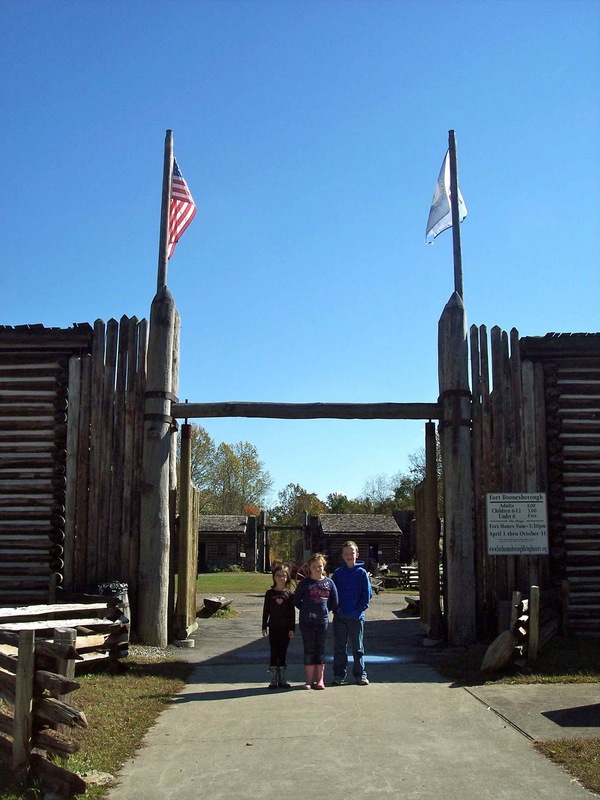 The fort was used as a temporary stopping ground for new settlers until they could build their own homes. The town of Boonesboro grew up around the fort. When they were attacked by the native Indians, the settlers would go into the fort and shut themselves and fight. Inside the fort, each dwelling was set up to show a different part of the settlers' lives. 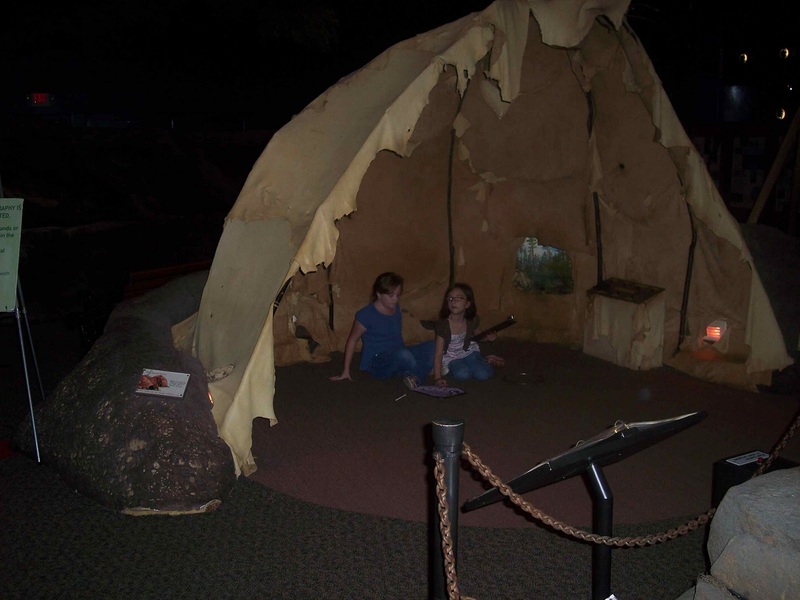 There were three different cabins, each showing a different stage of living based on how long the settler had been there. It went from hastily thrown together to very comfortable and homey. The other buildings in the fort showed essentials for the settlers. 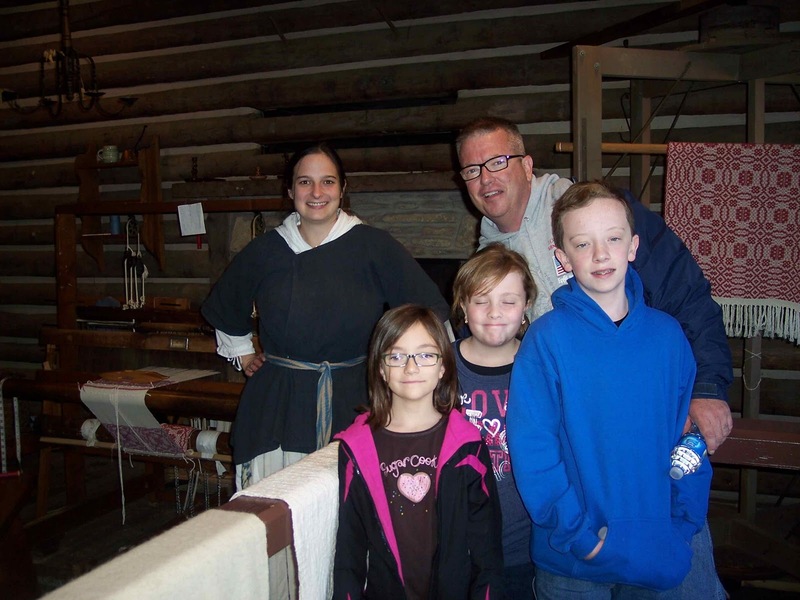 There was a weaver that made cloth to sell to the settlers for clothing. She had a two hundred year old loom that she was using. The whole process was very neat. Chrissy especially enjoyed that one. This weaver, Mary, has been weaving for nine years! She is very talented. There was also a gentleman that explained the tools and weapons used by settlers. Another was a tinsmith that would make anything from cups to candle holders for the settlers. This particular tinsmith is the only 18th century tinsmith in the United States today. Later centuries used more advanced tools, and there a lot of those tinsmiths out there. He was quite a character, too. The other buildings included a candle maker, a blacksmith, the general store, and a land office. The kids got to learn a lot about how hard frontier life was. I think they appreciate that they don't have that kind of life! 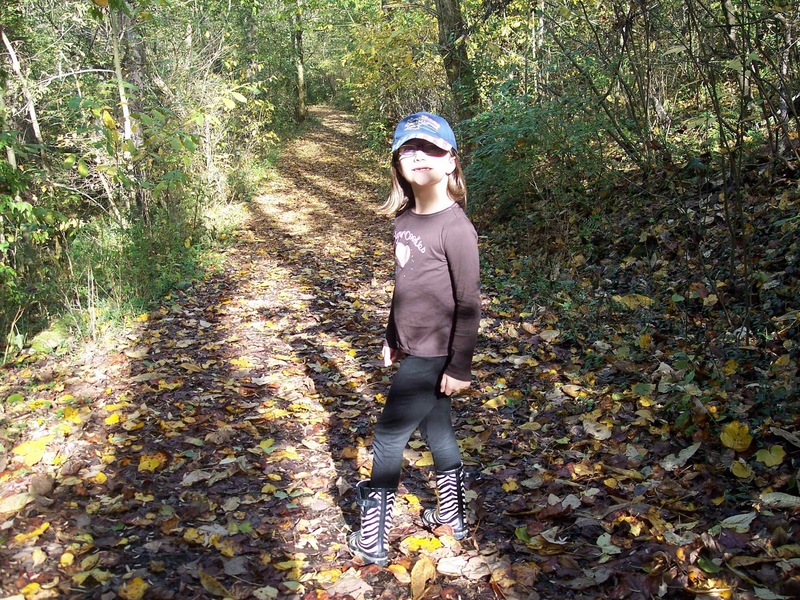 After a quick lunch in the RV, Jim and Chrissy took a walk on a nearby nature trail. Then they went back into the fort. Chrissy wanted to watch the weaver again, and Jim had a lot of questions about Daniel Boone himself. The gentleman with the weapons had a wealth of knowledge he had gained on his own time, and was happy to chat with Jim about it. We finished up there and headed down the interstate to Corbin, Kentucky. 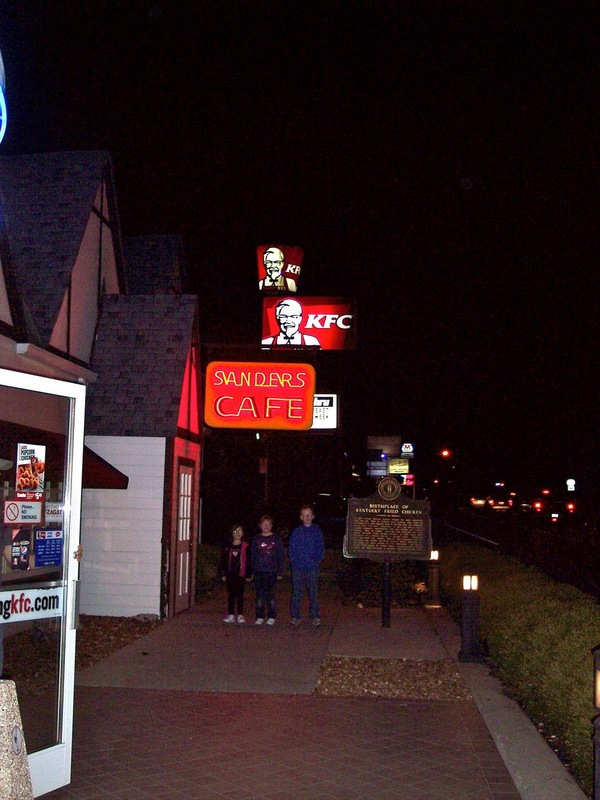 This is home to the original Kentucky Fried Chicken, started by Harland Sanders at his Sanders Cafe in North Corbin, Kentucky. While this wasn't the first chain KFC, it was where Sanders developed and highly guarded fried chicken recipe. This is a regular KFC, with a museum, a dining room designed from the original, a model motel room to show travelers how nice his motel was, and a duplicated kitchens, holding some of the Colonel's original cookware. It is just a neat place to go that isn't too far out of the way. Jim, Michael and I had visited ten years ago on the way back from West Virginia (deja vu! 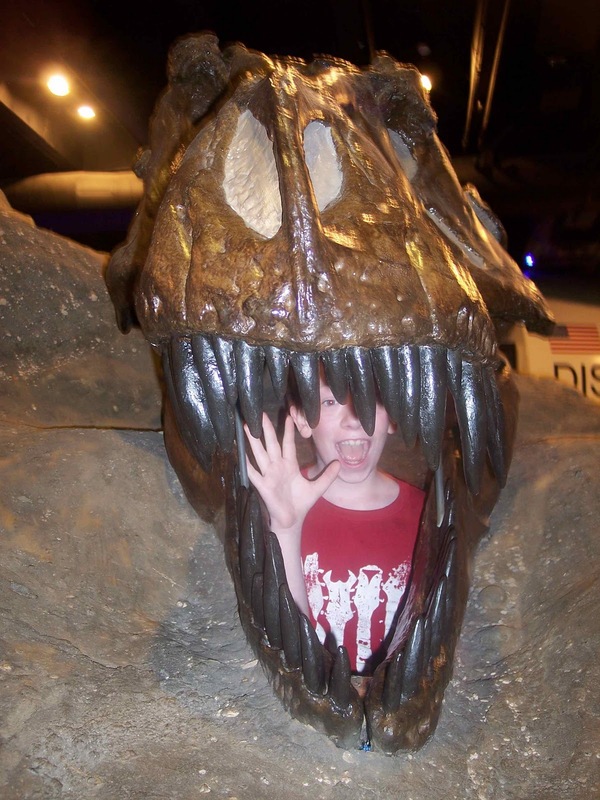 ), so it was kind of fun to take the kids by there. Tomorrow we will be in Tennessee! Today we moved on to Lexington, Kentucky. You may be wondering why we didn't stay in Cincinnati longer. There were several neat things we could do, but many of them were very expensive, and we were just ready to move on. I don't think there was anything we couldn't live without. 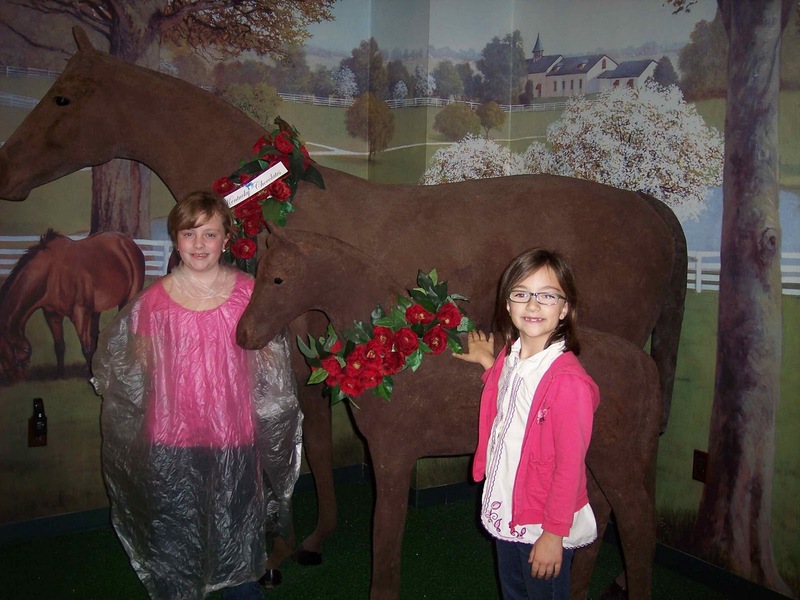 There were several things in Lexington that we wanted to do, but it was so rainy and yucky out that we couldn't. You can't exactly go to a horse farm when it's that nasty out. And the forecast called for the same weather for the next day, too. 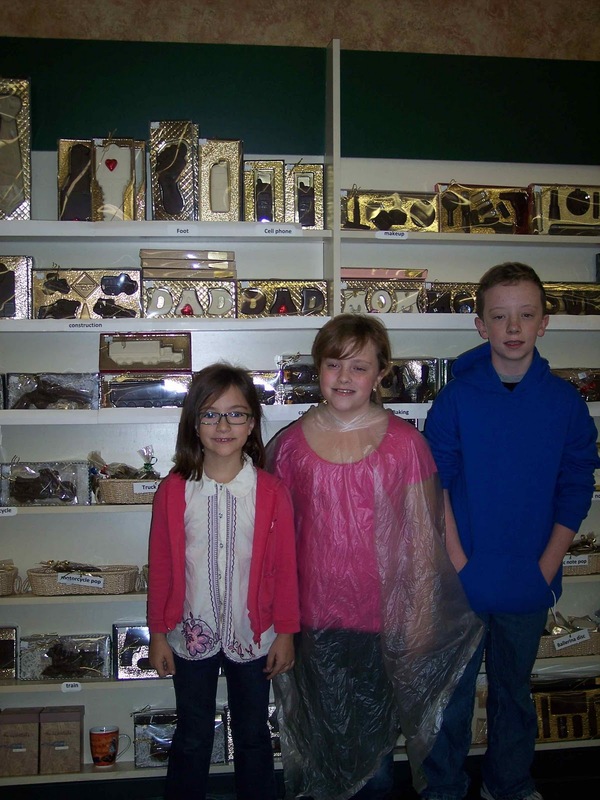 So what we did find to do was a chocolate factory tour! Who doesn't love some free chocolate?? 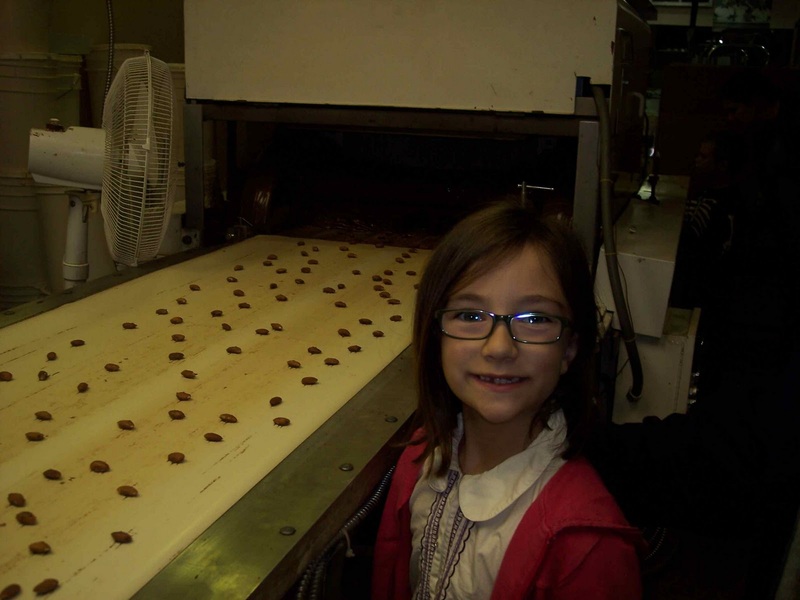 We visited the Old Kentucky Chocolates factory. They are well known for their bourbon cherries. Of course they say they are better than Rebecca-Ruth chocolates (that we had visited in Frankfort). And I realize that a lot of distilleries are in and around Lexington, but geez. I can't stand the smell of bourbon, much less the taste! This particular brand uses Jim Beam Bourbon. Good for them. At any rate, this was one of three Lexington retail locations, but the factory is located here. We were greeted and immediately offered free samples of our choosing. They had bourbon candies, chocolates, and fudge! Jim actually finished off their samples of peanut butter fudge. It was soooo good! We went through their factory where they actually allowed us to take pictures. This was the first warehouse/factory setting where we could do so. There process isn't much different from Rebecca-Ruth. 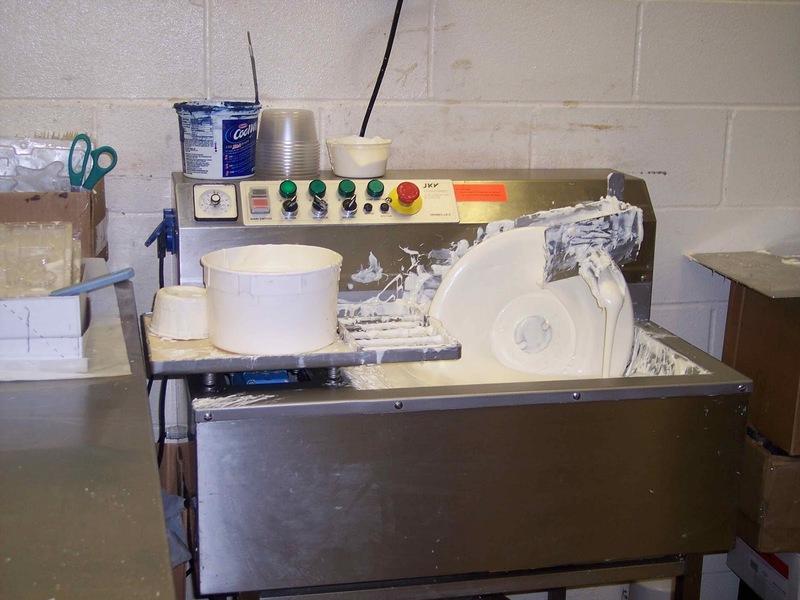 They melt the chocolate that they get wholesale (in 10 lb. blocks), and then make a variety of different candies with it. In the bourbon cherries, they soak the cherries in bourbon and coat them in sugar before covering them in chocolate. This basically breaks the cherries down, so that when you bite into them, they burst in your mouth. You actually can't take a bite, you have to eat it whole or you make a big mess. After our tour, we did some shopping in their store. We picked out a couple of small things for the kids to give others, however, we all picked out something for ourselves, too. Chrissy got a chocolate bar, so that she could have some left over for other days. Pretty smart, in my opinion. Rachael got her chocolate 'R'. Michael got popcorn flavored Jelly Belly jelly beans - he's not a chocolate fan. I got a chocolate covered pretzel stick. Jim got a bag of root beer barrels. Today we went into Cincinnati. We had planned on going to the American Sign Museum, but it turns out it is only open on weekends. 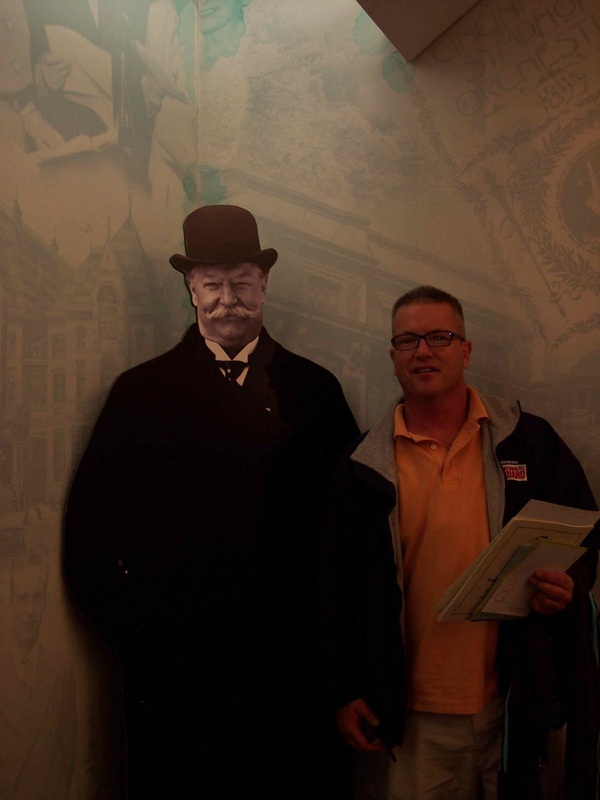 So our next destination was the William Howard Taft National Historic Site. 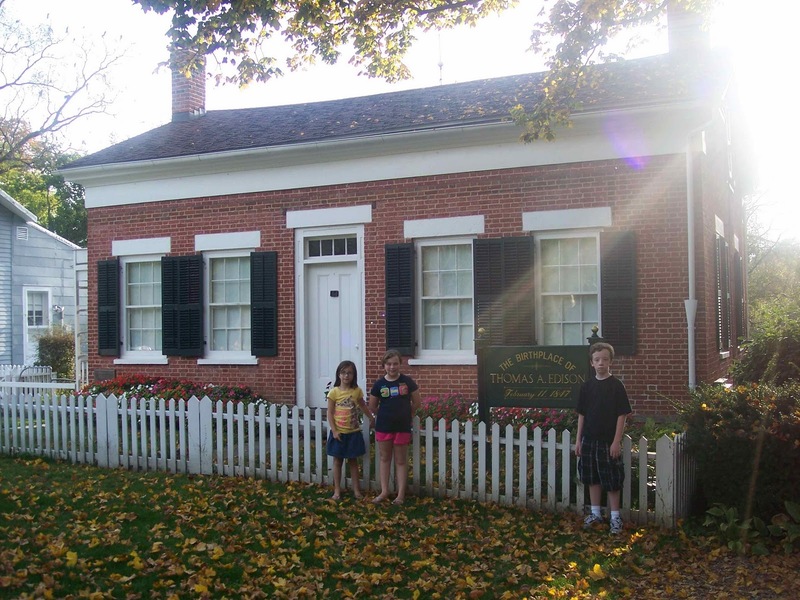 This is the childhood home of President Taft. The home sits on Auburn Hill in Cincinnati. Taft's father bought the home, which was fairly small, and moved his family in. However, shortly after, his wife and one child died of tuberculosis. Mr. Taft moved his parents in and remarried. He and his second wife had four children of their own, adding to the two surviving boys from his first marriage. Taft expanded the home to a mansion to accomidate his expanding family. President Taft was a well-liked man and president. He was hand picked by Theodore Roosevelt to succeed him as the Republican party's nomination. However, due to differences in policy, Roosevelt formed his own party and ran against Taft in the next election. They split the Republican party vote, and Woodrow Wilson easily one the election. Later Taft served as the Chief Justice of the Supreme Court, under President Warren Harding, which was a lifelong dream of his. He is the only president to have served in both positions. His home was beautiful, with the finest furnishings, many original to the Taft family. Mrs. Taft was known for her entertaining, and she became quite the trendsetter in Cincinnati. Mr. Taft loved to buy books, and would usually buy the first editions. In the library of the home, there are many of his books, under lock and key. Many of them are law books, but several are popular titles, such as Henry Wadsworth Longfellow's poems, and classics such as Gulliver's Travels. Gulliver's Travels - first edition!!! On the table in the room, there was a Cincinnati newspaper with the date of young William's eighth birthday. It is an original that is sitting there, not a copy. It was a beautiful home, but we really learned a lot about William Taft and his life. He was a well liked president. Very neat! 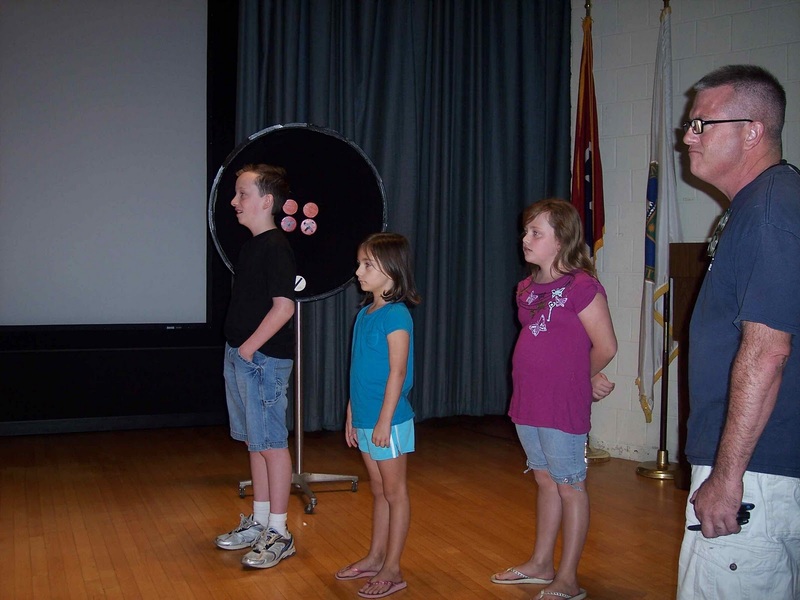 The kids also participated in the National Parks' Junior Ranger program. 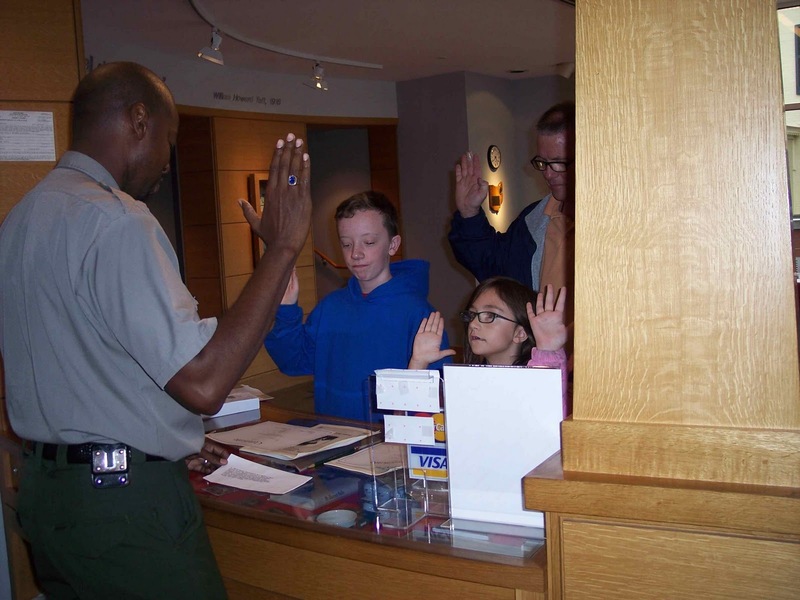 They complete a few questions based on where they are visiting, and they become "Junior Rangers" for the National Park. The kids had a pretty good time doing it, and Chrissy was very proud of her badge! Today we headed towards Cincinnati. Just outside of the city, though, was a little castle we found out about. Outside of a major city like Cincinnati is a strange place to have a castle, so we had to go see it. Chateau LaRoche is at the bottom of a hill overlooking the Little Miami River. It was constructed almost entirely by one man, Sir Harry Andrews. Harry Andrews was born in 1890, and a well educated man. He enlisted in the Army as a nurse in World War I, and later stayed in Europe for some years. As a child, he was fascinated by castles, and the time he spent in Europe only deepened that interest. He decided that he wanted to build his own. He knew, though, that some day he wouldn't be around to care for the castle, so he formed a group of 'knights' to care for it. To be a knight, you had to only do one thing: pledge to live a Godly life by following the Ten Commandments. He was concerned about the condition of society and he felt this was a way to change its direction. So, what would be more appropriate than to build a castle for the knights? The Knights of the Golden Trail was formed, and two years later, at the age of 39, Sir Harry Andrews began building his castle. 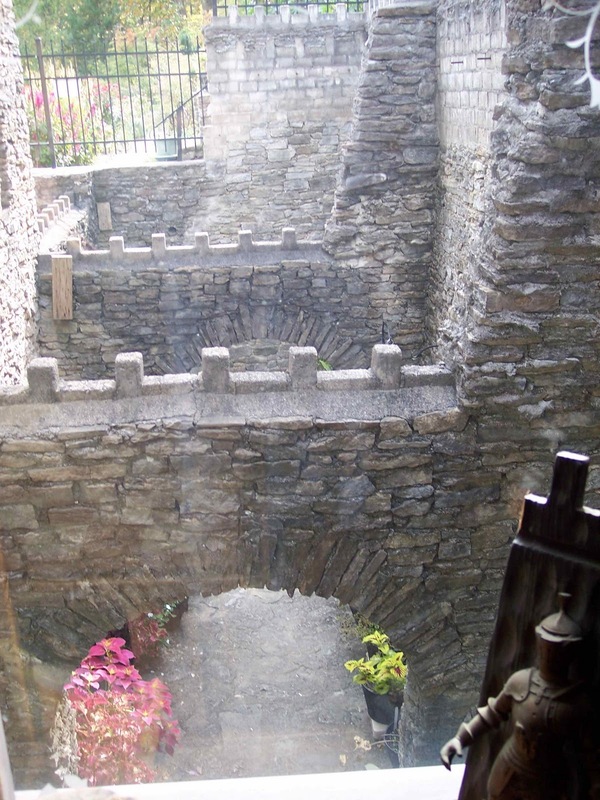 The outside of the castle is built from rocks that Harry carried up from the Little Miami River. It is estimated that he carried approximately 55,000 5-gallon buckets of rock up to the castle site. Many of the interior walls were formed by pouring concrete into square milk cartons. Once the concrete had hardened, you could peel the carton off. 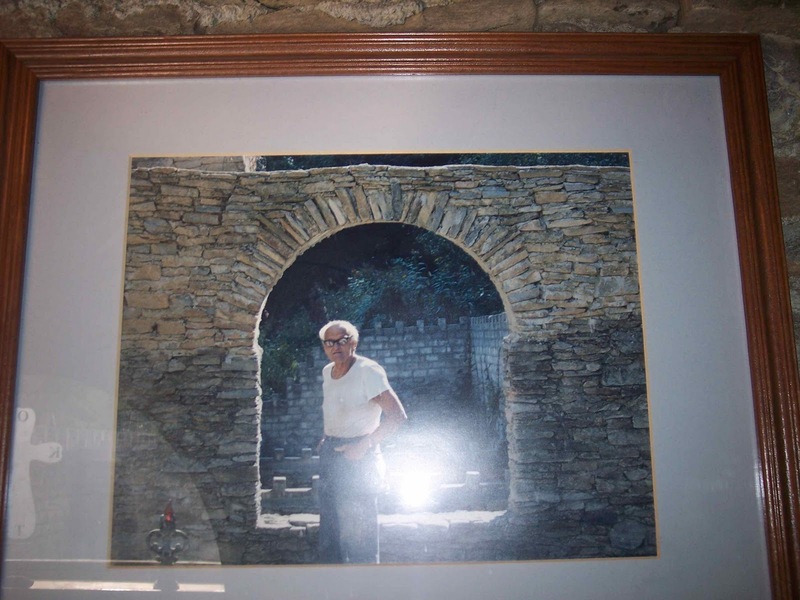 Harry continued working on the castle up until 1980, when he was 90 years old and passed away. He had continued to add wings and floors, never growing tired of the work. The castle is in the Norman style, and typical of what a knight would have lived in, not that of a king. Harry left no detail out, including the front door made of over 200 pieces and in three layers. A beautiful garden surrounds most of the castle. If you are ever near Cincinnati, PLEASE make time to see it. You won't be disappointed! And admission is only $3.00 per person. It goes towards the upkeep of the castle. All of the knights volunteer their time for tours and grounds work. Our tour was given by Sir Larry, and he did a fantastic job. 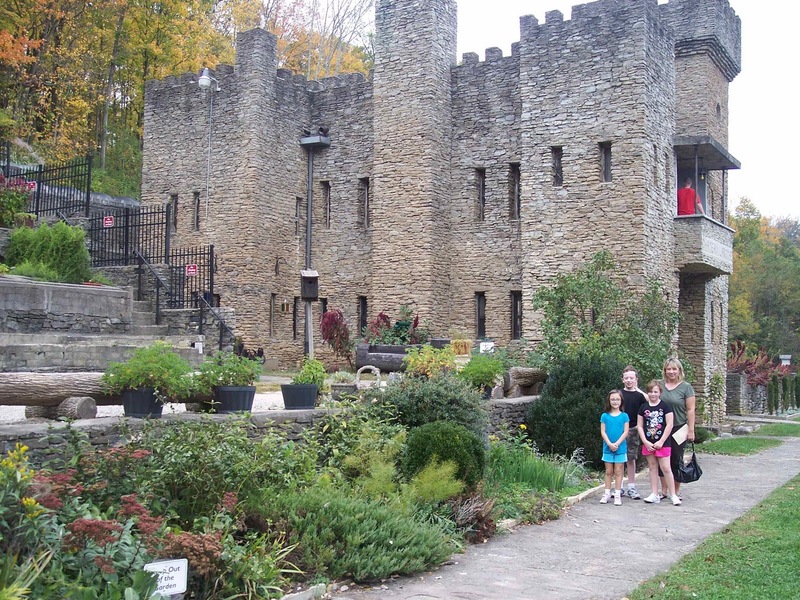 Visit The Official Website of the Loveland Castle for more information. Today is Columbus Day! So what better way to recognize this day than to spend it in the city of Columbus! 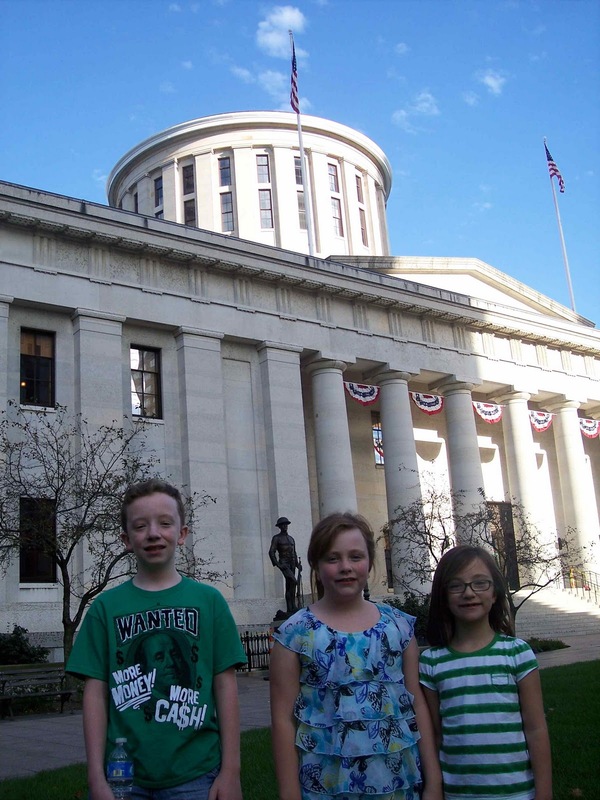 Even though it is a holiday, we decided to go ahead and see the Ohio state capitol and the downtown community. 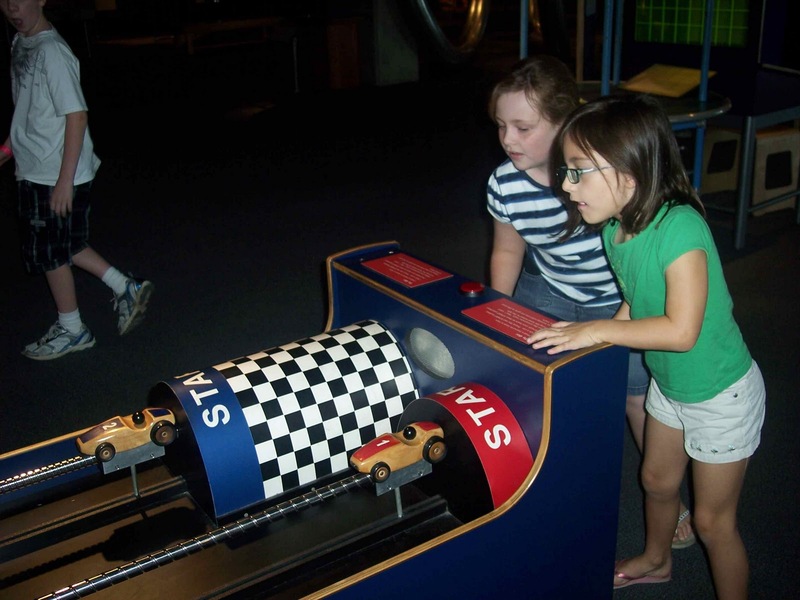 There is a great science museum in Columbus, but it is closed on Mondays and Tuesdays, so we will have to skip it this time. 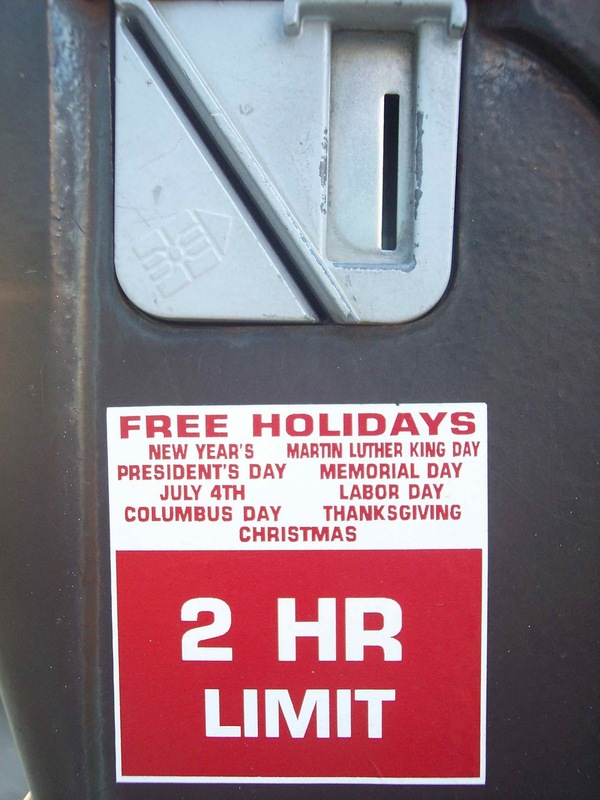 Since it was Columbus Day, we also got free parking! You know we love free! The capitol building was beautiful from the outside, and the surrounding grounds were well thought out. There were statues of famous Ohioans throughout. A large statue of William McKinley stood at the front of the building. Another area had a statue of Christopher Columbus with a fountain built in and important dates inscribed on it. There was an "Occupy Columbus" demonstration going on on the front side of the capitol. However, we didn't understand it, because everyone there was protesting something different. There wasn't one organized theme. Some were protesting capitalism, some the prison system, and yet another wanted children to have the right to vote. It was a little crazy, but a good learning opportunity for the kids. We had a young man stop us, wanting an interview. He is a journalism student at Ohio State University, and wanted to know our thoughts on the "Occupy Columbus" demonstration. So we shared our thoughts with him. The best part of the grounds, though, was on the east side. Hanging from the top of the walkway was a service banner displayed. This has one gold star, indicating a death or deaths in a unit, and a blue star, indicating a unit deployed. These flags have been in use since World War I, and can be displayed by individual families, too. The entire east side of the capitol is known as Veteran's Plaza. It was designed to resemble the areas that the military uses for field formations. There are fountains surrounded by flowers. At either end of the plaza, there are two Ohio limestone walls. 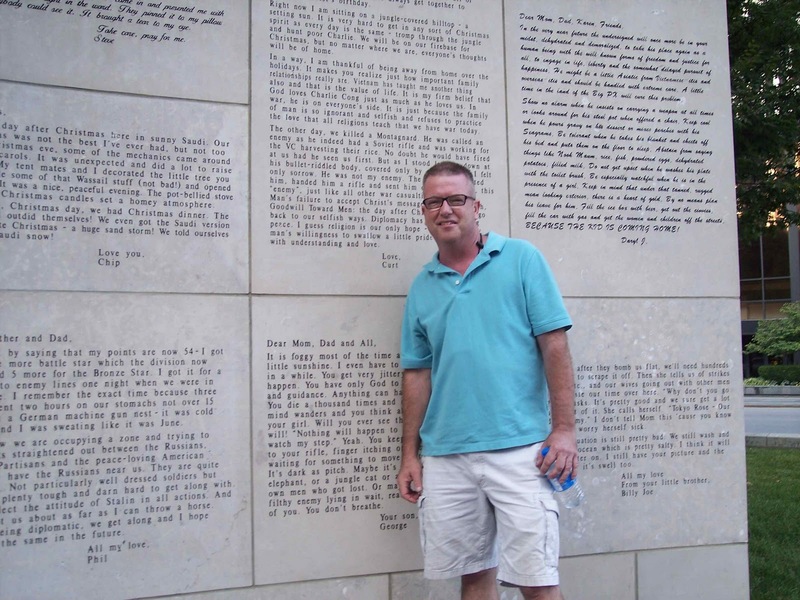 Inscribed on each wall are actual letters from service members to their families or friends. They cover all of the wars from World War II to the Gulf War I. 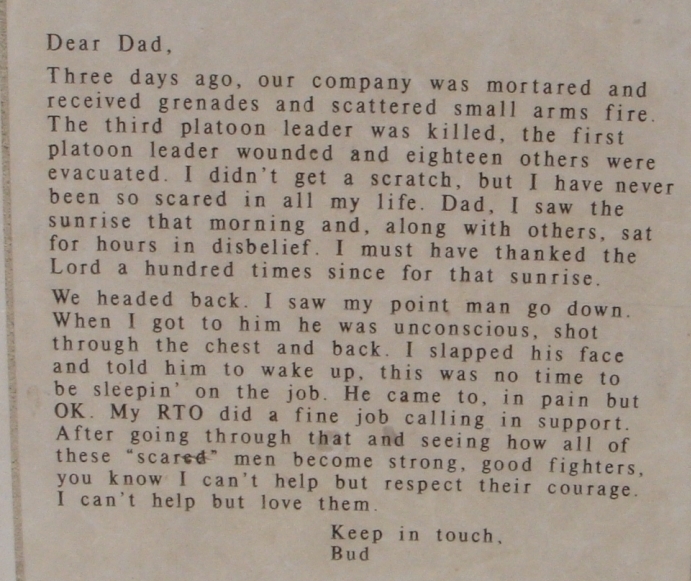 Some of the service members that wrote the letters were killed or missing in action, and are noted as such. 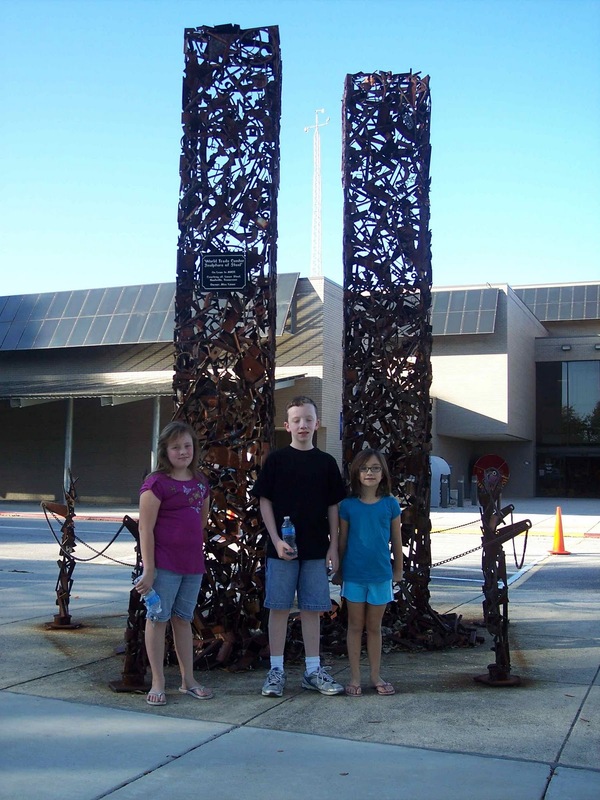 Somehow the letters transport you to how the families receiving them must have felt. Words cannot aptly describe the emotions that were stirred. And then I looked at my own husband, who was deployed, away from his family, and in combat. It made me almost thankful that I didn't know him then, and that my children never had to feel what so many others did. I'm even grateful that Taylor was too young to remember him being deployed. I didn't take a picture of any of the letters, but I found one online that I wanted to share. And this isn't even one of the more emotional ones, but still so moving. I know that this plaza alone made it worthwhile to visit the capitol. If you are ever near Columbus, make the time to stop by. Today we took some lazy back roads, through beautiful Ohio land, to the little town of Milan (pronounced m-eye-l-ann). Milan is the birthplace of Thomas Edison, and is where he lived until he was about seven years old. Milan looks like a little town on a postcard. Neat lawns, a historic town square. Back in its 'golden era,' Milan shipped more grain in the world than any other except for Odessa, Russia. The Milan Canal connected Milan to Lake Erie and opened up access for shipping in the area. We were pleasantly surprised to find out that this little museum is a part of the Blue Star Museum program, which we didn't know about. 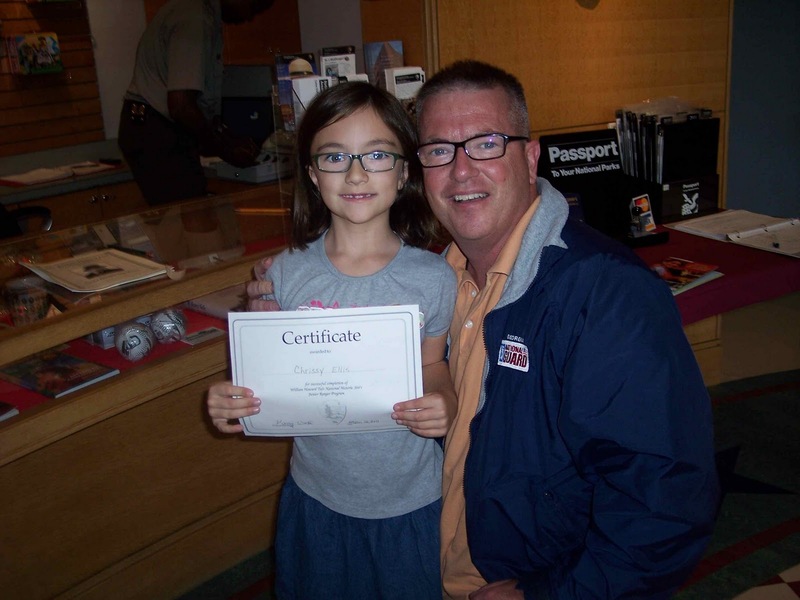 Blue Star Museums offer free access to military members, and retirees, and their families up to a total of five people. So we were all free! We got to the museum just in time to join the last tour of the day. 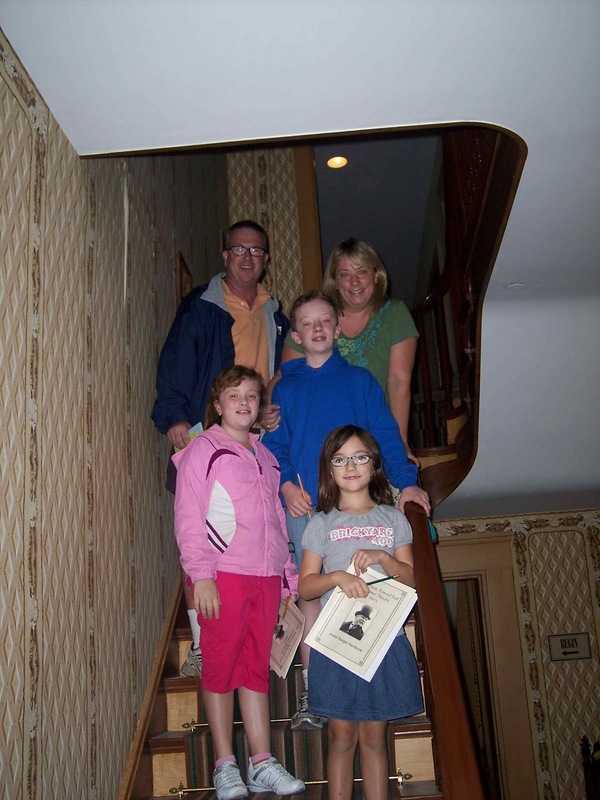 On the first floor of the room is the 'birthing' room where Thomas Edison was born on February 11, 1847. 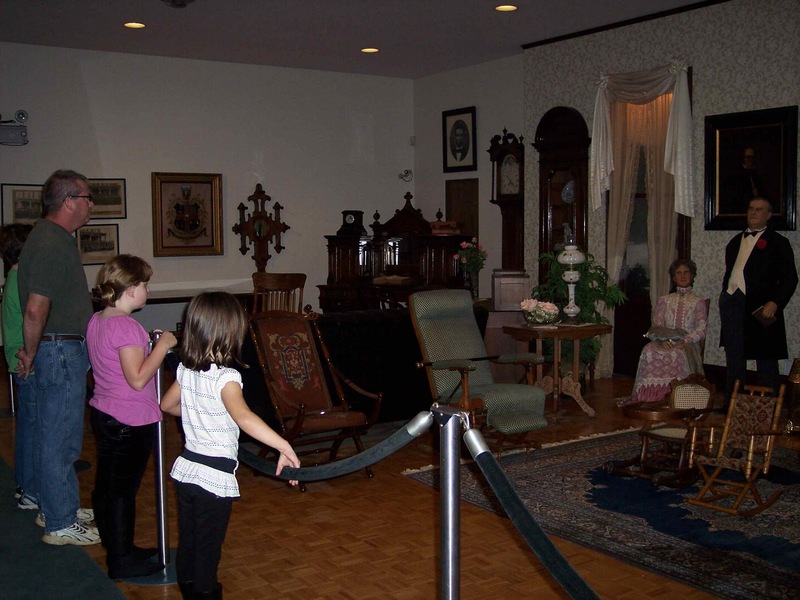 There is also a parlor where social gatherings were held, another informal room, and a small room that houses some of Edison's inventions and a large chemistry set he owned. Upstairs there is a bedroom where some of the children slept. There was a small, doll-sized set of bedroom furniture that matched the furniture in the room. The furniture in the room belonged to one of Thomas's older sisters. 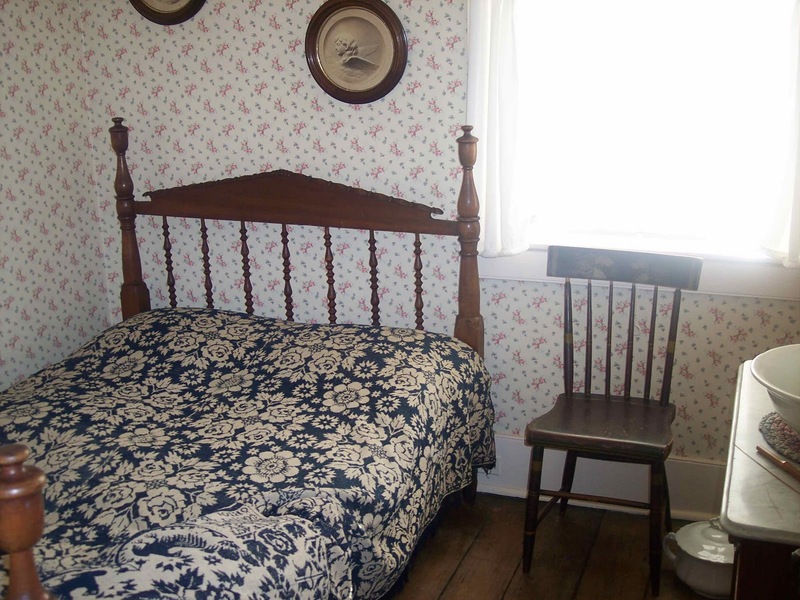 The master bedroom across the hall contains an original knitted bedspread belonging to Thomas's sister and made for her wedding gift by their mother, Nancy Elliot Edison. The two closets in the room have been converted to display cases. One contains two hats and two dresses owned by Edison's second wife, Mina Miller Edison. 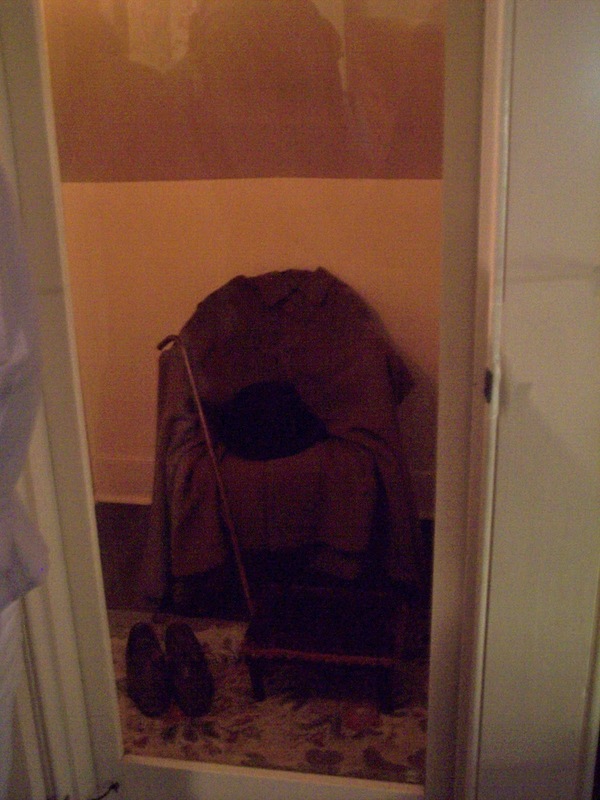 The other contains Edison's own coat, hat, and cane. The large basement houses the kitchen, where Edison's mother Nancy apparently spent all of her time, and it overlooks a beautiful garden and part of the Milan Canal basin. There were authentic tools belonging to Nancy Edison in the kitchen. 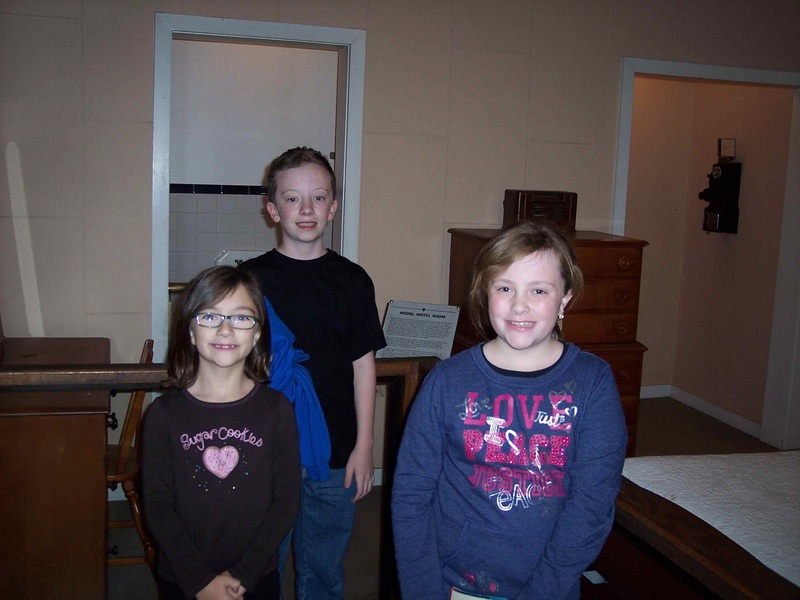 It was an interesting tour, and we learned a lot about Thomas Edison the man. After we finished the tour, we walked around Milan and explored the 19th century historical 'town' that is set up by the Milan Historical Museum. Although the buildings and exhibits were closed by this time of day, the grounds are open to walk through and enjoy. 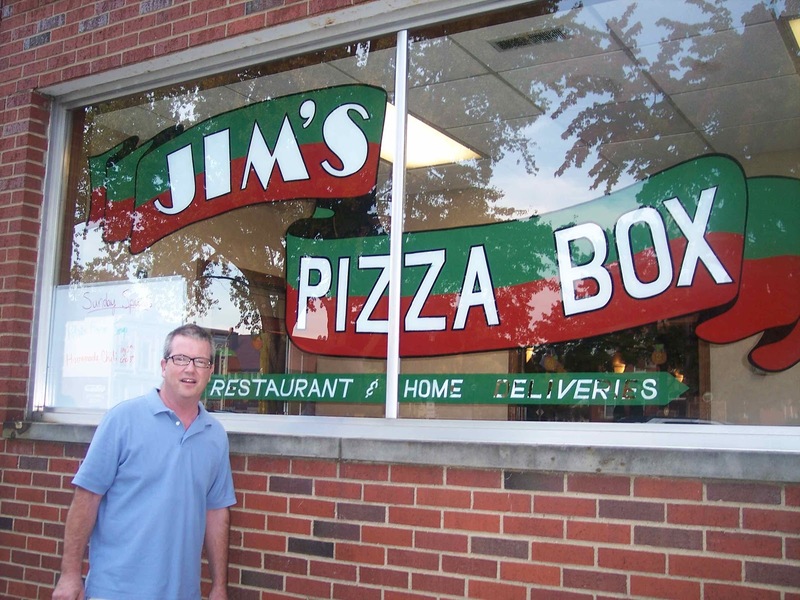 After our stroll through town, we decided to have dinner at a local favorite, Jim's Pizza Box. How could we pass that up with a name like that? The kids loved the pizza and Jim and I enjoyed our deli sandwiches. 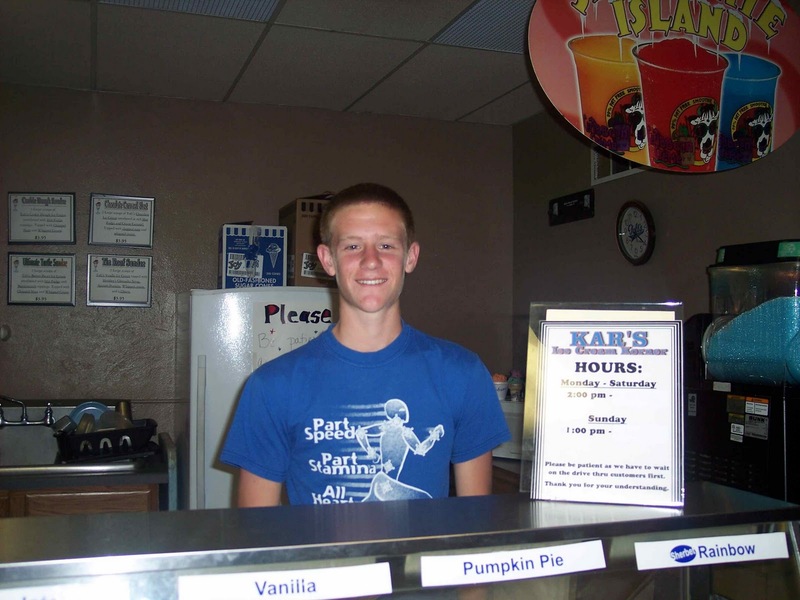 After pizza, we walked down to Kar's, which offers hand-dipped ice cream. Cody helped us with our order and delivered up tasty treats. Their ice cream supply is quite large during the summer, but once fall approaches, they use up whatever they have and don't reorder any until March. Being so cold in the winter, they don't have much of a demand for ice cream, so they shut down that part of the store until spring. It was a beautiful day with lots of learning! 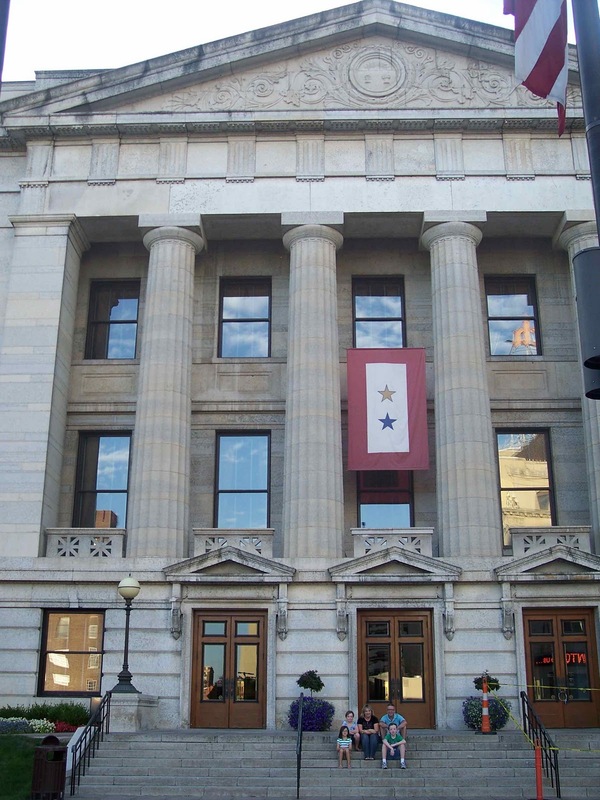 Tomorrow we are on to Columbus, the state capital! 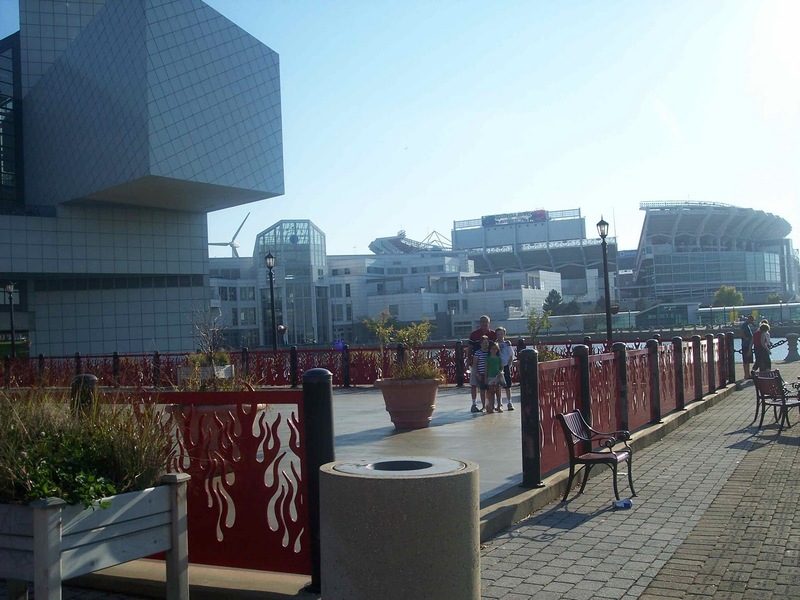 For day two in Cleveland, we headed to the Great Lakes Science Center, which is right between the Rock & Roll Hall of Fame and the Cleveland Browns stadium. It is so neat how all three of these magnificent buildings are right there together, and at the edge of Lake Erie, no less! Our entry into the Science Center was free! 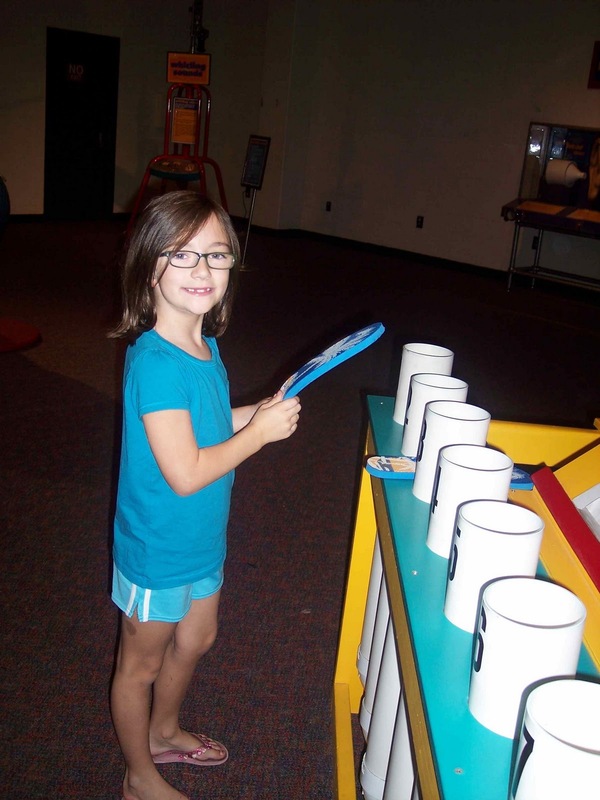 How much does add up to now that we've saved with our Fernbank membership? I should really add it up and see. But I digress. 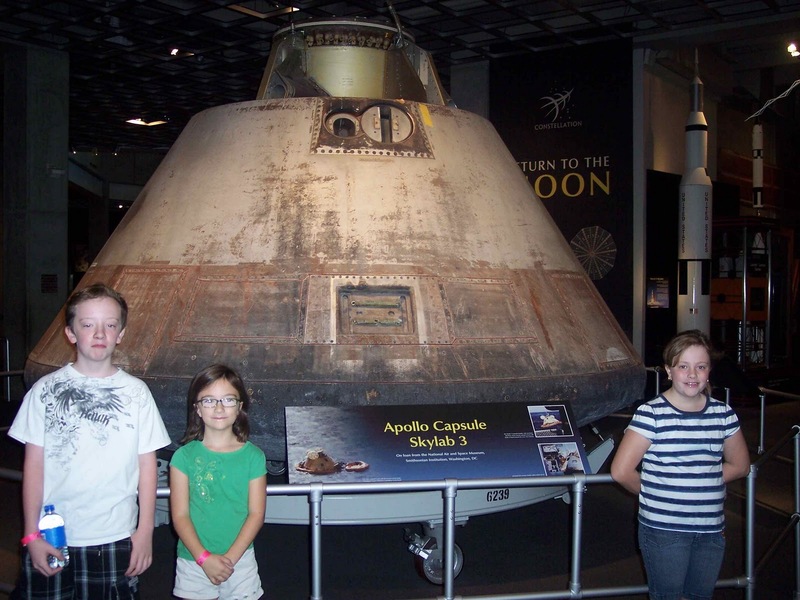 The main floor of the Science Center houses the NASA Glenn Visitor Center , where you can see the Skylab 3 Apollo Capsule on display, as well as building your own space station, controlling a mini moon-rover, and run through flight simulations. This was a great exhibit and an unexpected treat - we didn't know it was located in the Science Center. 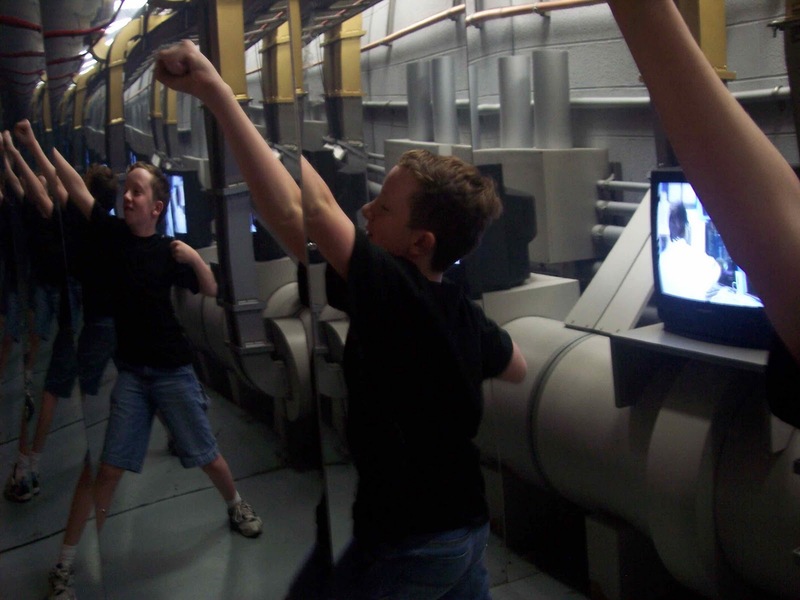 Also located on the main floor is the Center's IMAX theater, and a physical science lab. We didn't take in the "Tornado Alley" movie, but we did go to the physical science lab. 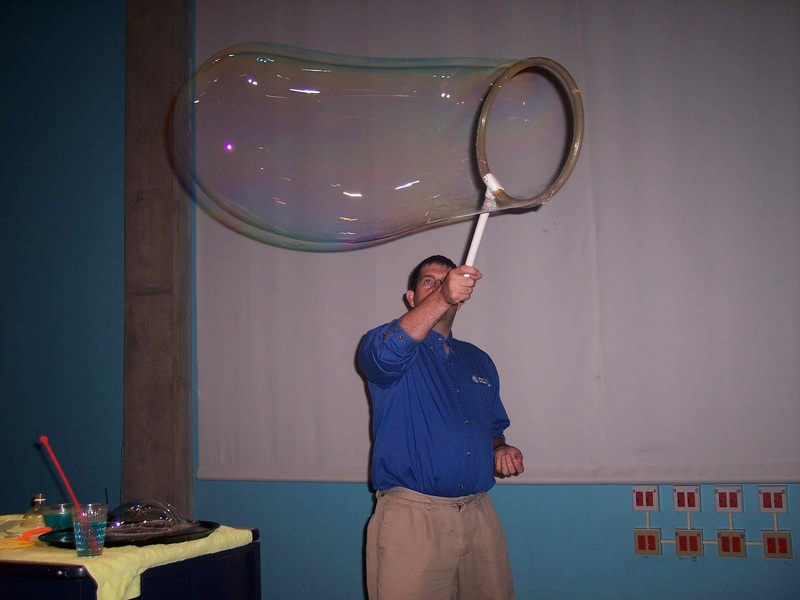 This lab was all about bubbles - so the kids loved it. They learned about what you need to make bubbles, why they are always round, a great recipe to take home, and how recycling can be part of bubble-making. There was only one other family there with us in that part, so the kids got to participate and ask as many questions as they wanted. It was a lot of fun. After the bubbles, we moved on upstairs, where the fun hands-on exhibits are located. 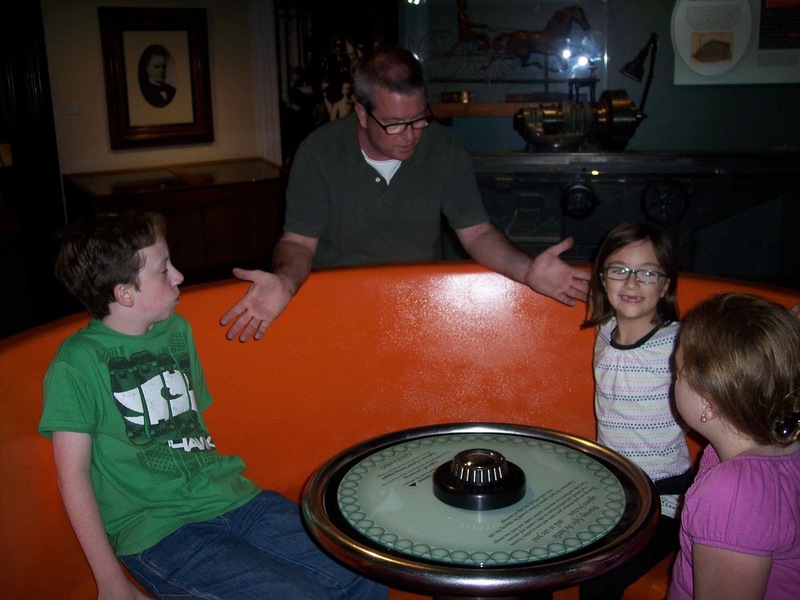 Some were the same that we had seen in other museums - the tornado display, how prisms work, but others were new and really fun. They had one where you can pitch a baseball and it uses a radar to tell you how fast you were. Another was a hang gliding simulator. Yet another tested the speed of your reflexes working with your peripheral vision. Another taught you how to mathematically estimate how many gumballs were in a jar. We spent a long time there just trying everything out. We had a bunch of science lessons, too. And the kids didn't groan about a textbook - there weren't any! 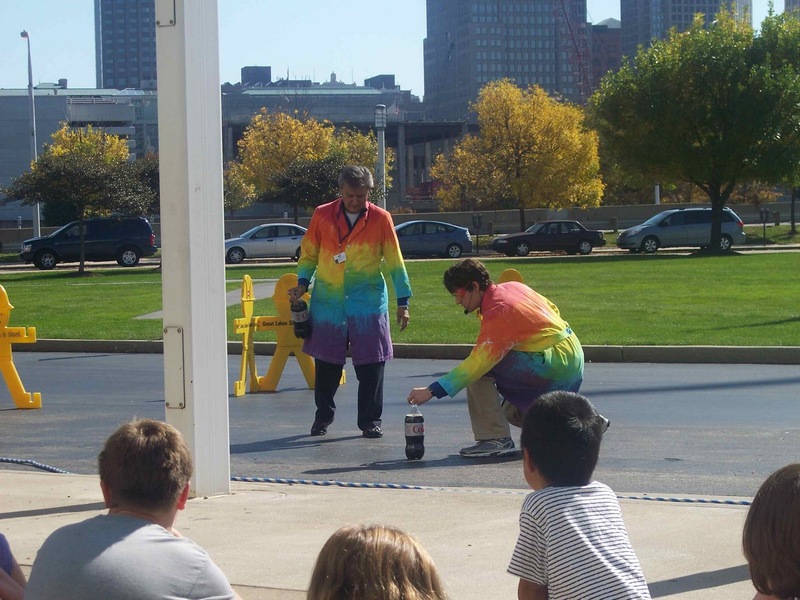 After a lunch break, we went onto the front lawn for another science lab - The Big Science Show. This was all about gas build up - the carbon dioxide kind! They used a little gadget we were familiar with - the Mentos tube and a 2-liter diet soda. Michael has this kit at home, so we knew what was going to happen. You drop Mentos into the diet soda and it causes a geyser. The more Mentos you put in at once, the bigger the geyser. It is really neat to see how far up in the air they shoot. After The Big Science Show, we headed to the bottom floor of the Center. This is where they house their temporary exhibits. 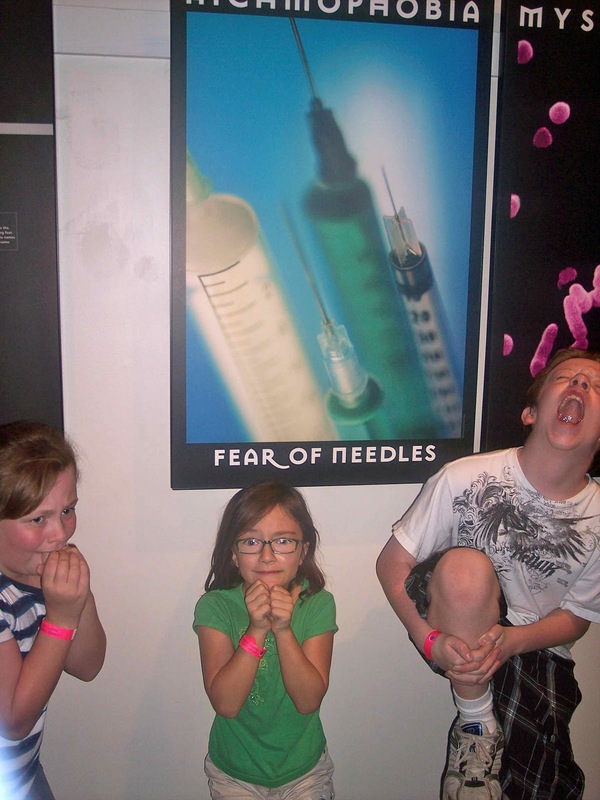 The current exhibit is called Goose Bumps: The Science of Fear. It allows you to test your fears, explains why our bodies react the way they do when we are scared, and much more. About 90% of the exhibit was interactive. In the test your fears section, you could test your fear of sound, falling, electric shock, and the dark. We tried all of them. Well, Jim and I did. We couldn't convince the kids to do them. We video taped Jim's fear of falling test. After your test is complete, they play it back for you, and that's what we taped. That is one I didn't do, though. I absolutely hate roller coasters, and it isn't because of the height. Jim couldn't believe I wouldn't get on that one. Watch his below. Jim said it surprised him, that he didn't expect to feel that way. Good for him. I still wasn't getting on it. By the time we finished all of the Goose Bumps exhibit, it was time to grab our postcards from the gift shop and head out. 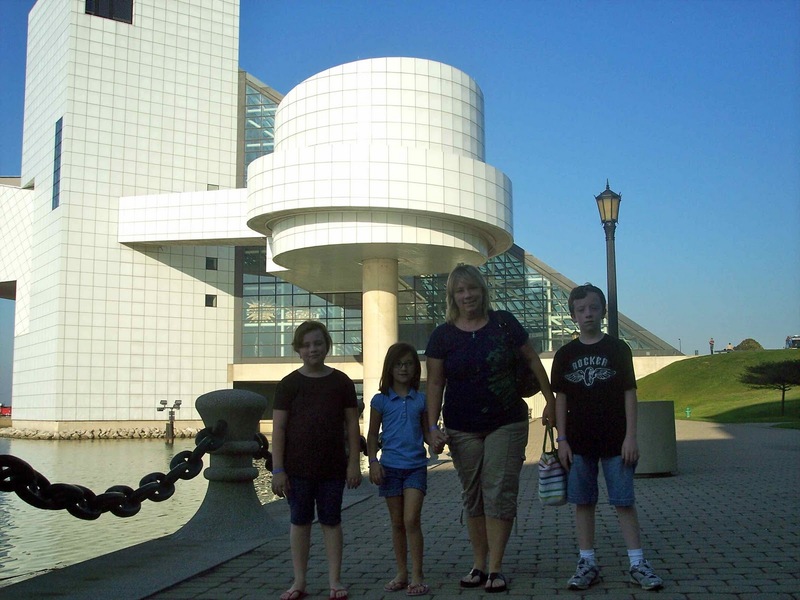 We still wanted to take more pictures out in front of the Science Center and the Rock & Roll Hall of Fame. It was a beautiful fall day in Cleveland, and we enjoyed it! More pictures in the Photo Gallery - and there are a lot! Great scenery to enjoy! Today we were ready to Rock! 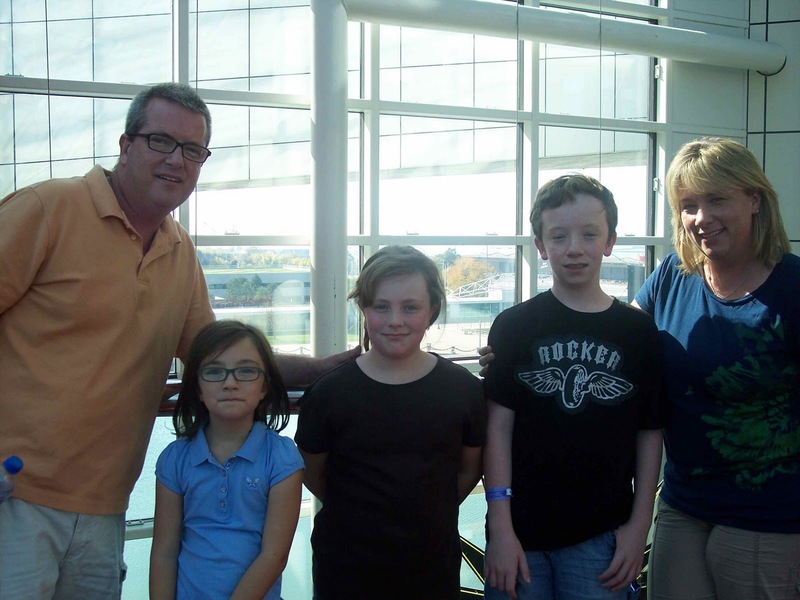 We headed over to the Rock and Roll Hall of Fame and Museum in Cleveland, right on Lake Erie. I can't even begin to describe all the awesome things housed in here. The biggest bummer - you can't take pictures of any of the exhibits. So our pictures are only in open areas like the lobby/entrance and the little food court. The museum starts out on the bottom floor with a movie called the "Mystery Train," which traces the roots of rock and roll. From there you move on to a timeline of early musicians, followed by an enormous Elvis Presley display. There are several of his outfits displayed, as well as movie scripts, contracts, letters written to Elvis, and much more. There is a Cadillac he bought for a body guard of his, too. He had his initials painted into the trim of the car. A giant screen played concert footage nearby. Fitting for the King of Rock & Roll. After Elvis, the displays went through different eras of rock music. There were clothes, notes, playbills, and all sorts of mementos from rock and roll greats. Hank Williams, The Beatles, Janis Joplin, The Rolling Stones, Madonna, and the list goes on. I think the handwritten notes and songs were the neatest things. You could see the artist's thought process when they were writing songs. Very cool. There was also a theater that had a continuous four-hour rotation of rock music by Hall of Fame inductees. There is a special exhibit of Hall of Fame inductees. A movie there shows each year's inductees and concert footage of each. A winding walkway has autographs of the members. At the top of that walkway were displays of this years inductees, a few of which include Neil Diamond, Alice Cooper, and Darlene Love. 2012 Nominees are out and winners will be announced soon. You can easily spend more than a day here. There is so much that is included, from so many different eras. There is something for everyone. I don't think we could have listened to every booth, watched every movie, and read each item in one day. This well worth a visit if you are ever in Cleveland! For more info, click HERE. We had decided yesterday to go back to the McKinley Monument and Museum today since there was so much we didn't get to see. So once we got there, we went back to the main part of the museum to finish looking at the "Street of Shops." Once we had done that, we headed downstairs to the "Discover World" exhibits. This was a small, but VERY interactive science museum (Yes - free admission for us!) They had three different, age appropriate scavenger hunts. Chrissy and Rachael worked on theirs together, I worked with Michael, and Jim took lots of pictures. On the girls' scavenger hunt, they had to match the picture with the animal in the museum and list it's number. Michael also had to do that, but he had to match a characteristic of the animal, as well. The first section was called Discovery Island and had different fossils and models of dinosaurs and things from the dinosaur eras. There was a big electronic dinosaur that greeted you when you walked in. Another section had computers set up to play dinosaur related games. One neat feature was the area that you could make fossil imprints. It had an inverted image of a fossil on a metal plate. They provided you with a piece of aluminum foil and a roller. Once you placed the shiny side of the foil up and used the roller, you came out with a great fossil image. We took pictures of these because we knew that the aluminum foil wouldn't last without getting messed up in the RV. The second area was called Ecology Island. This had a scavenger hunt, too, but it involved real animals! There were several types of fish, insects, snakes, a rabbit, mice, and an opossum. The volunteer took the possum out and offered to let us pet it. We did, and it was very soft. Still kinda gross, though. The third area of the museum had a lot to do with how things work; things like why airplanes fly and why you see colors in bubbles. 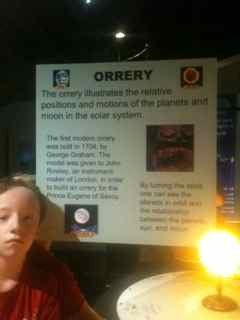 The neatest thing to me and Jim was called an orrery. An orrery illustrates the relative positions and motions of the planets and moon in the solar system. In simpler terms, it gives you a visual so that you can understand why the northern and southern hemispheres have opposite seasons. This particular orrery was only of the sun, Earth and our moon. Much larger and more complicated ones have our entire solar system on them. For anyone who has ever struggled in understanding all the simultaneous rotations that are going on, this would definitely clear it up. It was so cool. Of course, I don't think the kids were as excited about it as Jim and I were. But that's okay. Someday I will whip one of these out (or find one online) to show them when they get confused! 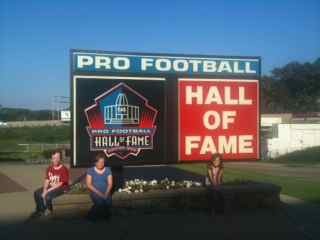 So after we finished up at the Discover World, we headed to the Pro Football Hall of Fame, which was only about a mile away. You would think it would be really easy to find, but it wasn't at all. But after several turn arounds, we finally got there. We didn't actually tour the museum because it would have cost us over $75 to do so. None of us are that big of football fans, so it was something we could live without. We did go into the lobby to take pictures, though, and made a visit to the gift shop. The things in there were just as expensive as any other NFL shop I've ever seen. I suppose there are people that pay that much for a hoodie. However, I am not one of them. 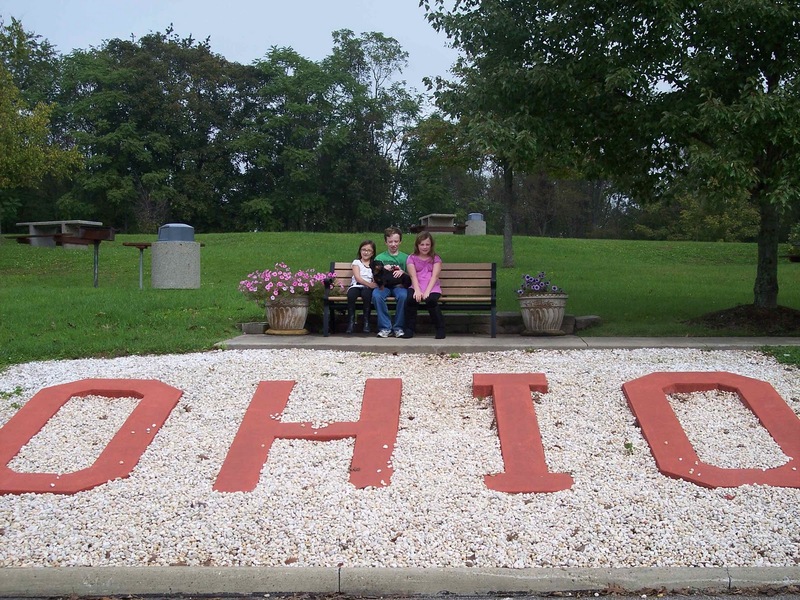 We headed on down the road, but we soon stopped for a break at an Ohio rest area. 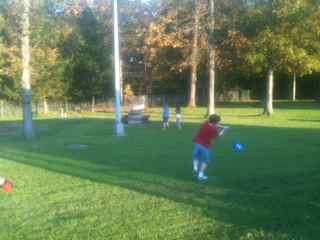 We let the kids run around in the sunshine, played Frisbee, and let Sam off his leash for a little bit. It made for some good down-time. We are headed into Cleveland, which promises to be a lot of fun! Today we drove into Canton, Ohio. 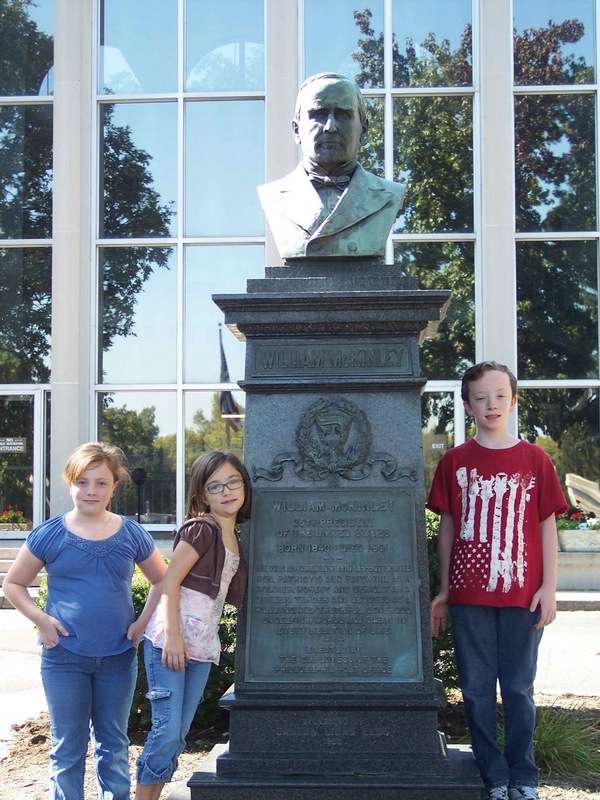 Canton is home to several noteworthy attractions, one of which is the William McKinley Presidential Library & Museum, as well as his monument. Since we had a bit of driving to do on the way, it was in the afternoon before we got to the museum. This was another freebie courtesy of our Fernbank membership. 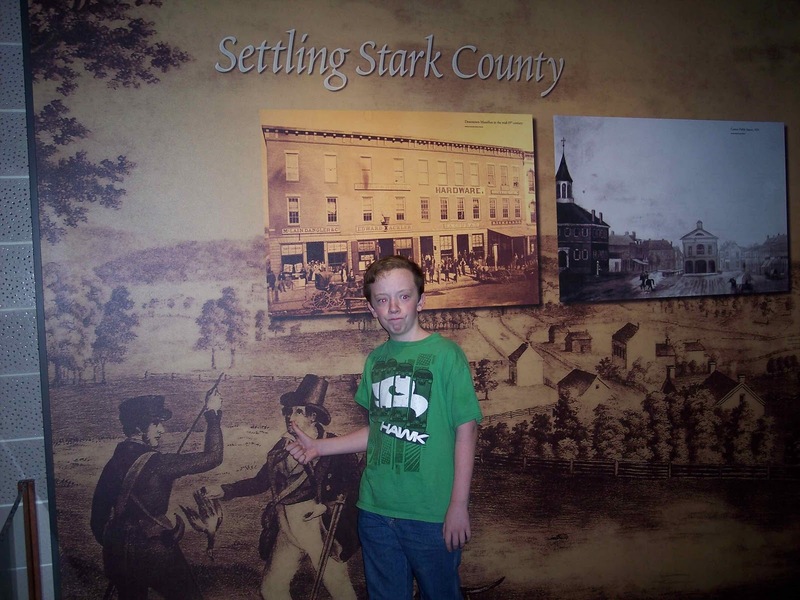 In the upstairs area of the museum, there was a walk through time of Stark County, where Canton is located. 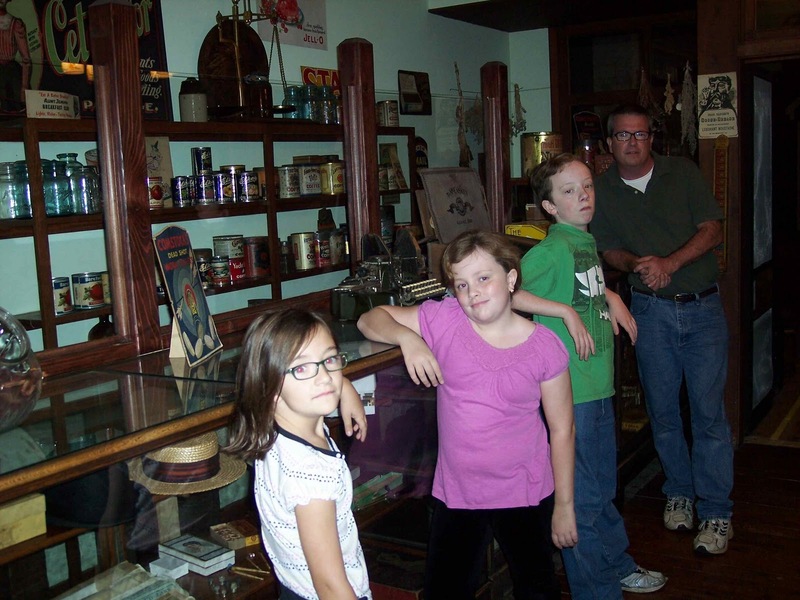 There were artifacts from the local area from the 1800s through present day. There were displays by companies from the area, like Hoover Vacuums, from nearby Akron, Ohio, and Timken Bearings in Canton. The kids learned about how bearings fight friction. Very cool science lesson! Or a lesson on bearings and friction? By far, though, the most impressive exhibit was of President and Ida McKinley. 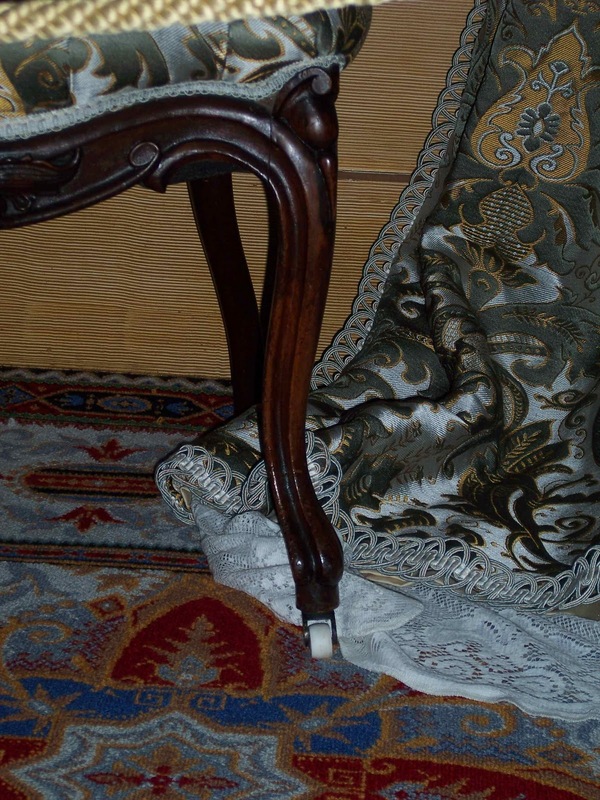 There were original pieces owned by the McKinleys; everything from letters and furniture to top hats and gowns. The neatest part was the animated McKinleys. They began talking when you came into the room, welcoming you and discussing their lives. Towards the end, Mrs. McKinley begged President McKinley not to greet people at the upcoming Pan-American Exposition in Buffalo, New York. She felt it wasn't safe. She was right. There was also a street of shops in an old version of Canton. There was a hat maker, a doctor, a hotel, toy shop, and many others. There were amazing collections in each 'shop.' There was a huge train display, too. We didn't have time to see the whole museum, especially the Discover World portion of the museum, so we decided to go back tomorrow. Even though the museum was closing, the monument wasn't, so we headed up the hill to take a look. Pets were okay as long as they were on leashes and you cleaned up after them, so we took Sam along. The McKinley's crypt (coffins?) are above ground in the monument. The monument is a huge dome, but very simple in design. The McKinley's crypt(?) is in the center. Words from President McKinley's last speech are inscribed around the top of the inside of the dome. 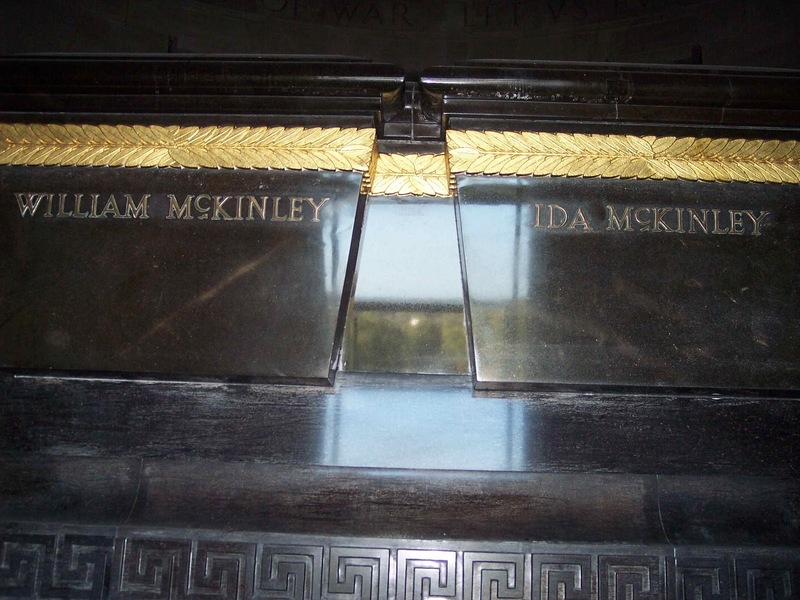 The McKinley's two young daughters are also buried in the back wall of the monument. They died very young, one at four months and the other at three years, and it is said that Ida McKinley never recovered from their loss. The surrounding lawn is absolutely beautiful. After almost a week of rain, we were so thankful for the sunshine, and the temperature was just right. 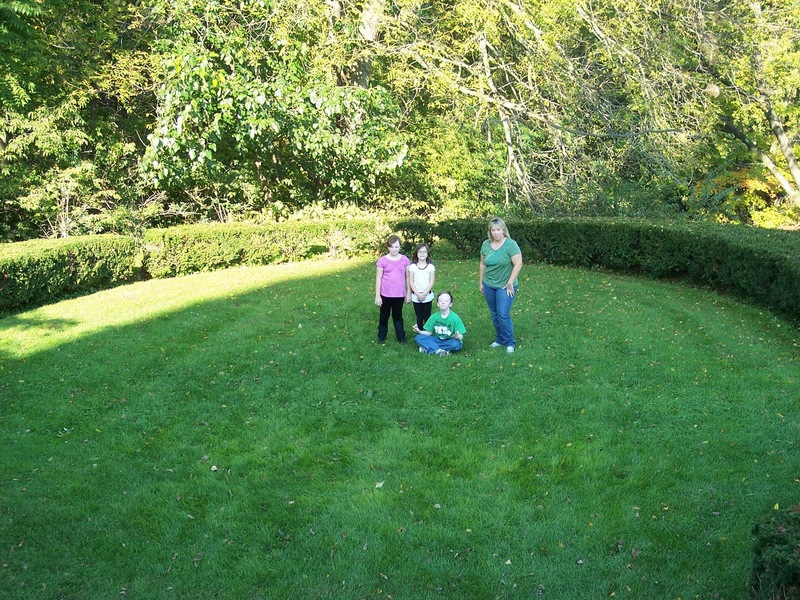 We let Sam run around with the kids and play, and we all enjoyed the time outside. 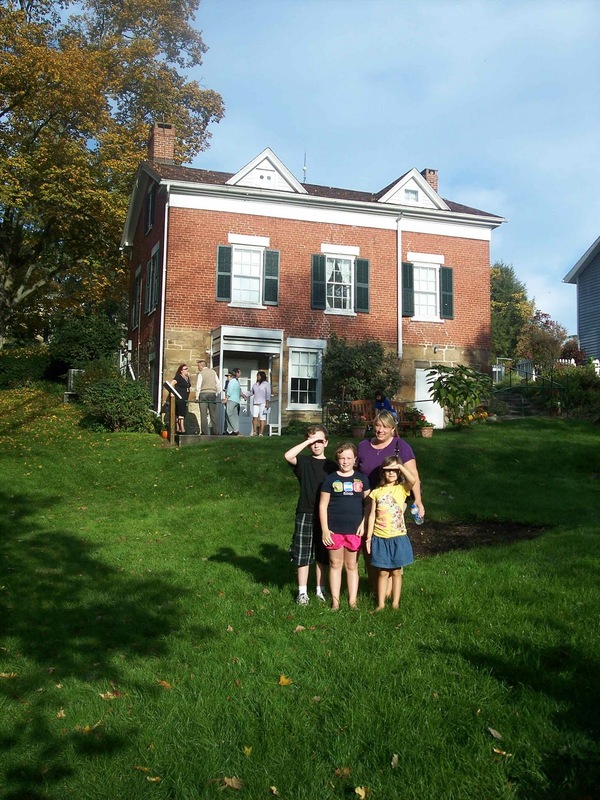 Learn more about the McKinley Library & Museum HERE.